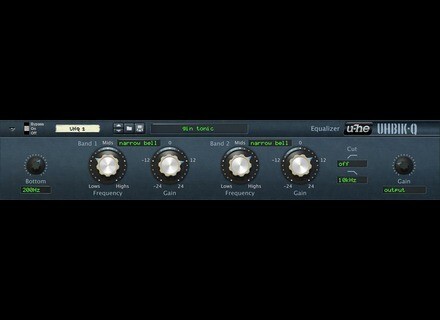 Uhbik-Q Rack Extension, Software parametric EQ from U-He. u-he have released two more effects from their Uhbik range in the Propellerhead Rack Extension Store. The new RE versions are based on the same algorithms as their AU and VST counterparts, but the GUI and feature sets have been modified to suit the Reason rack. Uhbik-F is a flanger unit capable of tape-recorder style (through-zero) true flanging as well as analogue stomp-box feedback effects. In addition to Reason-typical integration, with CV inputs for all important parameters, Uhbik-F also features two CV outputs from the stereo LFO. The introductory offer of 19$ / 15€ is valid until November 12th 2012, after which Uhbik-F will be available for 39$ / 32€. Uhbik-Q is an equalizer. The features include two semi-parametric bands with various modes, a bass boost stage, low-cut and high-cut filters as well as a third semi-parametric band ("hidden" underneath the gain knob). All knobs can be controlled by CV inputs. The pricing for Uhbik-Q is the same as Uhbik-F, but the introductory offer ends November 5th (as it came out a few days earlier). For more info, visit u-he's website – or jump into the Rack Extension Store and download the 30-day trial versions. Softrave Vintage Effect Pack Softrave has released Vintage Effect Pack for Windows, which includes four VST Effects. Abeem Rack Performer 0.98-beta2 Abeem Live Technologies has updated Rack Performer to version 0.98-beta2, its last public beta version.